Men's skiers speed through the Keyhole section of the Silver Belt Banzai course at Sugar Bowl on Sunday. The Silver Belt Banzai and accompanying Super Finals marked the fourth and final stop of the Rahlves’ Banzai Tour, an annual race series that sends skiers and snowboarders down a resort’s natural terrain in four-person heats. The series is a spinoff of the historic Silver Belt, a giant slalom race that attracted the world’s top alpine ski racers from 1940 through 1975. Sugar Bowl revived the Silver Belt in 2004, using the same historic course down the belly of Mount Lincoln, but adding the exciting element of skicross and snowboardcross. After running the new Silver Belt Banzai in 2004 and again in 2008 and 2009, Rahlves expanded the event into a multi-stop tour with big-name sponsors and a total prize purse worth $80,000. SUGAR BOWL — Olympic snowboardcross racer Nate Holland almost forgot just how burly the Rahlves’ Banzai Tour can be. A few years had come and gone since Holland — an eight-time X Games champion — last competed in the Rahlves’ Banzai Tour. In Sunday’s balmy tour finale at Sugar Bowl, the special guest found himself in a mad dash for the finish line, trying to fend off a hard-charging Jayson Hale, Lucas Dehmlow, Bobby Minghini and Sylvain Duclos in a one-run, winner-takes-all Super Final worth $5,000. Before Holland could fully catch his breath, event emcee Roy Tuscany of the High Fives Foundation announced that racers were on course for the Men’s Skier Super Final. Like the snowboard Super Final, men’s ski winners from the previous three stops of the tour received a shot at a special guest racer — event founder and former Olympic alpine skier Daron Rahlves — in a one-run, winner-takes-all heat worth $5,000. The race featured Kyle Coxon, winner of the first three stops and last year’s Super Final champion, as well as Shawn McGee, Ben Paciotti, Cory Zila and Rahlves, who sat out last year’s Super Final with an injury. Unbeaten in Banzai Tour competition, Rahlves got the hole shot out of the gate and pinned it down the natural terrain of the historic Silver Belt Gully course, which was steep and technical due to the low snowpack. He popped into view atop the final slope, McGee and Coxon close behind, and straight-lined the bumpy pitch to the finish line, where he was greeted with a celebratory hug from Holland. “He’s unbelievably fast,” said McGee, fired up after placing third in the Super Final and winning the men’s ski finale a half-hour prior. Coxon, who rubbed shoulders with McGee before passing him in the final 100 feet, gave Rahlves his due credit but did not concede much else. “He’s pretty darn fast. He’s not unbeatable though,” Coxon said. All that action was limited to the two Super Finals. Leading up to that, skiers and snowboarders battled through multiple four-person heats in the fourth and final stop of the Rahlves’ Banzai Tour — Sugar Bowl’s Silver Belt Banzai. The tour began at Kirkwood and followed with events at Squaw Valley and Alpine Meadows, all of which were used to build points toward the lucrative tour titles. 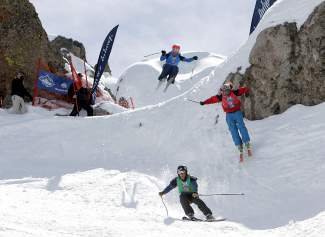 First up was men’s snowboarding as racers took to the challenging natural terrain of the mountain, which always has been the trademark of the series. Hard-pack snow in the morning softened as the day warmed, creating variably slushy conditions and ideal viewing for the sun-drenched onlookers. “The racing was awesome. Conditions got better, the crowd got wilder — it got more fun as the day went on,” said Hale, who finished runner-up to Frenchman Sylvain Duclos in the first two tour stops before edging Duclos in a photo finish in the third stop. Trailing Duclos by 20 points in the season standings, 280-260, Hale needed to pull off another victory to claim the overall title, worth $3,000. As it turned out, both of the top contenders were matched up in the same heat from the start. The pair advanced with top-two finishes through the first three rounds, setting up a men’s snowboard final with Duclos, Hale, Minghini and Dehmlow. Hale got the hole shot out of the gate and never looked back en route to the win. Dehmlow was second and Minghini third, while Duclos, who fell, rounded out the heat. The victory gave Hale the season title. In the women’s snowboard final, Audrey Hebert of Banff, Alberta, who entered the day tied for second in the season standings, raced to victory ahead of Mariah Dugan, Kiana Putman and Beth Weissman to overtake Casey Lucas for the series title. Lucas led the standings after three events, with 230 points to Hebert and Putman’s 190. But she did not advance past the semifinal round and finished fifth. Iris Lazzareschi, who won the first stop at Kirkwood and was fourth in the standings, finished sixth on Sunday. The women’s ski final came down to a couple of familiar Banzai Tour foes — former World Cup moguls skier Shelly Robertson and defending champion Shannon Rahlves, sister of Daron. Robertson edged Rahlves at Kirkwood, while Rahlves took wins ahead of Robertson at Squaw Valley and Alpine Meadows to carry a 20-point lead, 280-260, into the Silver Belt Banzai. Rahlves seemed poised to repeat as champion as she took an early lead and blazed down the course in front of her competition, which also included Kara Munsey and Allison Tanner. But Robertson stayed on her heels, then pounced after a slight bobble slowed Rahlves before the final pitch, allowing Robertson to squeeze by. “The last run was crazy intense,” Robertson said. “She got me out of the start, so I just tried to stay as close to her as I could and find my spot to pass, and it happened to be on a tight little gully, and we bumped a little bit but I held on. I saw her make a mistake in front of me; she almost went over her handlebars, and I knew she was going to be in recovery mode, and that was my chance to pass. With a stacked men’s ski field, it was anyone’s race to win, despite the fact that Coxon had swept the first three events. McGee, who was second in the points standings, took the win in a final heat that included Paciotti, Zila and Casey Riva. Jesse Maddex won the small final for a fifth-place finish, while Coxon, who also failed to make it out of the semifinal round, finished behind Maddex in sixth. It didn’t matter, however, as he held a commanding lead over McGee entering the finale, 300-205, and still finished as the points leader to secure the overall title. In addition to the race winners, Hale was awarded the inaugural “Live Free and Send it” award, given in honor of last year’s men’s snowboard champion, Chelone “Chilly” Miller. Ronnie Schoff won the Alaska Airlines “Flight Deck” award for the most impressive air, as he threw a backflip through the Keyhole notch to earn $100 toward any Alaska Airlines flight.